The Class of 2018 will turn their tassels May 12 at TCC’s commencement ceremonies. 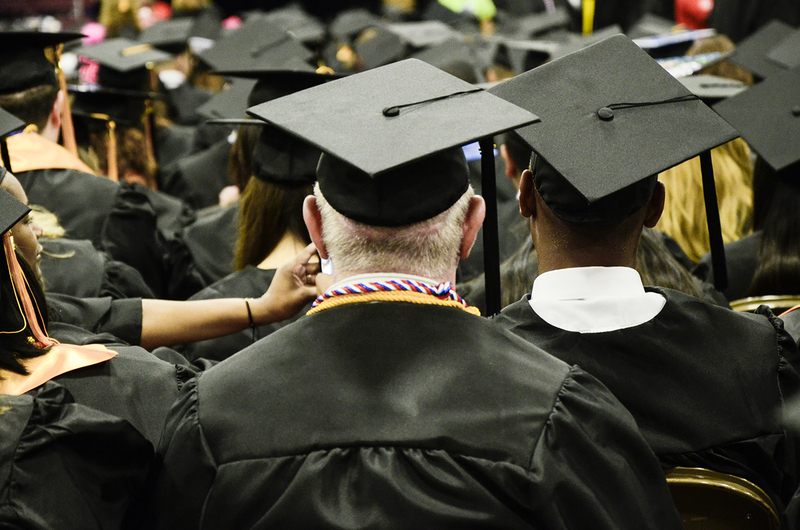 Two ceremonies will be held at the Fort Worth Convention Center, one at 11 a.m. for graduates assigned to NE, SE and Connect Campuses and the other at 3 p.m. for graduates assigned to NW, South and TR Campuses, said district admissions and records director Rebecca Griffith. “All early college high school graduates will participate in the ceremony which corresponds to their campus,” she said. Both ceremonies will last approximately two hours. Opportunities for students to celebrate triumphs are rare, and every educational credential earned is a major accomplishment, said TCC’s communications, public relations and event marketing executive director Suzanne Groves. “It’s also a time for friends and family who supported each graduate to share in the joy,” she said. This year, the college expects to have over 2,000 graduates participate, which is up from last year’s 1,750 participants, Groves said. But the 2,000 participants are only a fraction of the number of students who will receive a degree and/or certificate. “In the most recent complete reporting year, TCC students earned more than 7,800 degrees and certificates,” Groves said. Graduates were assigned a check-in time, which appears on the name card they’re required to have, she said. “Name cards will be mailed to students no later than Friday, May 4,” Griffith said. The cards will also have the graduates’ assigned ceremony. They will be mailed to the address the college has on record, she said. To get a name card, students must submit a Commencement Participation or Commencement Walk-Only Approval Form. The deadline to apply to participate in commencement is May 4. The online version of the forms are no longer available through WebAdvisor, but the paper version can still be obtained in any campus advising office. TCC’s 2018 commencement ceremonies will be held at 1 p.m. and 3 p.m. May 12 at the Fort Worth Convention Center. Graduates have until May 4 to apply to participate in the ceremonies. Friends and families who come to see the graduates walk can enter the arena an hour before the ceremony, she said. Guests do not need tickets to enter. The ceremonies will be live-streamed, so those that can’t attend can still watch, she said. Recordings of the live-streams will also be available on TCC’s website after May 12. 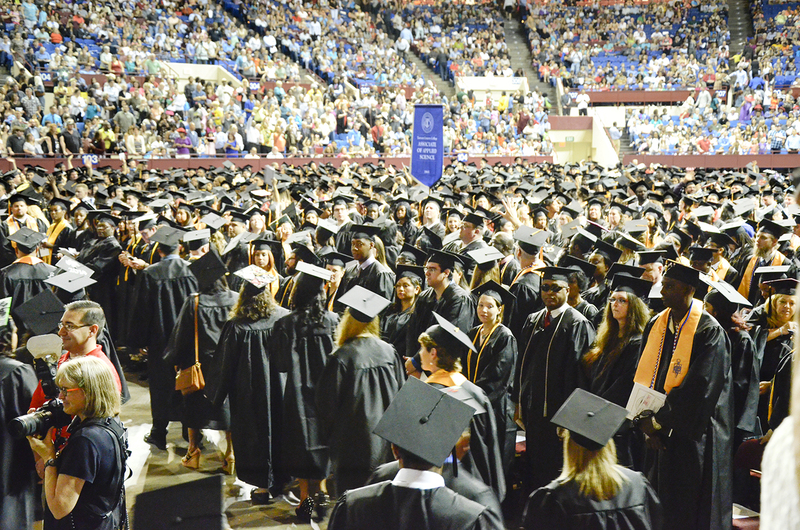 TCC’s graduation ceremonies will not feature graduates lined up alphabetically, Griffith said. “Graduates will walk by degree type,” she said. TCC has no dress code for what students should wear under the gowns, but due to the amount of walking and standing, Groves recommends people wear comfortable shoes. Graduates can get their caps and gowns, provided by TCC at no cost to the student, at any TCC bookstore through May 8, she said. For anyone that can’t pick up their cap and gown by that date, a limited supply will be available at the ceremony during check-in, Griffith said. “To pick up, a student must be approved for participation,” she said. Honors cords for those eligible will be distributed at the convention center, and Phi Theta Kappa stoles are available for a fee through the NE Campus PTK chapter or at the ceremony. TCC is also having a cap decorating contest. Students can post a picture of their decorated cap on Facebook, Twitter or Instagram using the hashtag #TCCgrads. Entries will be judged on creativity with an added bonus for those who represent their field of study on their cap. “The winner will get two Texas Rangers tickets and gear,” according to an email sent by NE student activities. Students can submit photos of their cap using the hashtag or post the photo to TCC’s Facebook wall until 5 p.m. the day of graduation. Students can share their graduation stories using the same hashtag. They can also tag the college on Facebook, Twitter and on Instagram, Griffith said. To tag it on twitter, use the handle @TCCollege. For Instagram, use @TarrantCountyCollege. Students can also honor professors, advisors, family members or friends that have helped them along their educational journey with a personalized tribute at alumni.tccd.edu/tributes. For any questions about commencement, visit www.tccd.edu/academics/graduation/ or email graduation@tccd.edu.